Tucked away in a quiet corner of Venice, only a short distance from Saint Mark's Square, the apartment offers the enchantment of a gondola-filled canal, the tranquility of a private, shaded courtyard, and the splendor of a Venetian home. To live and breath the atmosphere of a Venetian house facing a small and typical canal. 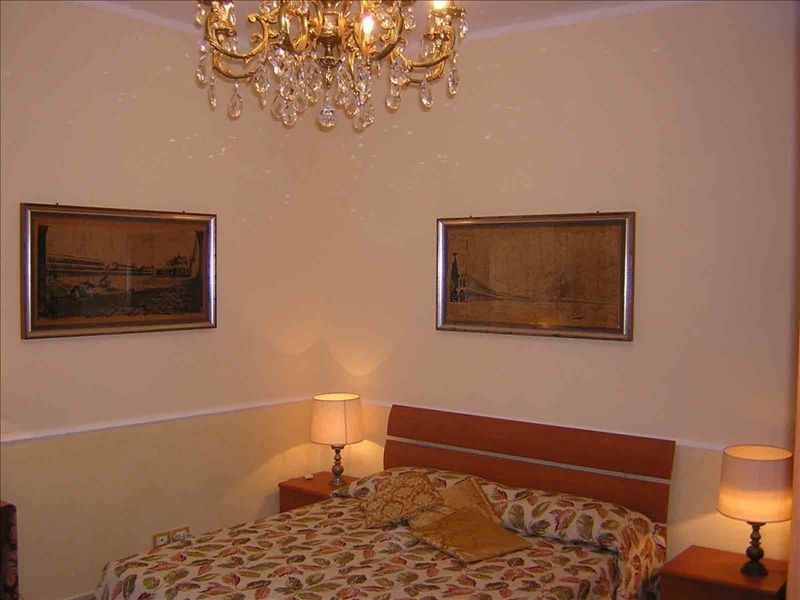 The position of this apartment is very central, very close to San Marco, to the Ponte di Rialto and the Fenice Theatre. This makes of this apartment a desirable place for a relaxing holiday, in the heart of the enchanting city of Venice. Positioned near the small “campiello” towards the entrance of the famous theatre of the artists from which the name originates, the apartment is on the first floor (about 20 steps up) In a Venetian house, easily recognizable for the “patera” an artistic decoration which for centuries has ornamented the house. The apartment is approximately 90 square metres and is very light; it has 10 windows, 6 of which are original stained glass original from the 18th Century. Recently refurbished (January 2008) it has central heating , air conditioning in both bedrooms and in the dining/living room. Tucked away in a quiet corner of Venice, only a short distance from Saint Mark's Square, the apartment offers the enchantment of a gondola-filled canal. you are in the center of venice close to a lot of shops, restaurants. Venice is very hard to navigate. Venice is very hard to navigate. There are many small alleys and dead ends due to the waterways. Navigating was further complicated by the owner not giving us the complete address of the apartment, including the zip code, which we asked for in several emails. Without the ZIP Code, Google maps could not identify the apartment. For the first two days of our stay we were completely lost and had difficulty finding our way back to the apartment. When the owner finally gave us the complete address, including the ZIP Code, Google maps made navigating the city completely simple. Also, to get to the apartment from the boat dock requires going up and down two sets of bridges over the water. Each of these bridges is 12 steps up and 12 steps down. I had an 80-year-old friend with a heart condition who was not capable of pulling her own luggages on these bridges. Once you get to the apartment, you also had to climb a flight of stairs to get in. People with limited mobility, need to know this about the apartment. The apartment is very charming. Being able to watch the gondolas right outside your window was a special treat. I really would love to be more helpful with you, but unfortunately you phone was not working in italy. my apartment is on the first floor and steps are reasonable for venice. Apartment on the groundfloor aren't good because of humidity ad high water. The apartment is awesome, well decorated, many facilities like dish washer, clothes washer, great located. Paula is great hostess, giving many tips. Attention to the check in Place and time. I had difficult because my phone didn’t work, but I had wonderful stay. Fully furnished and functional. Everything you want and a canal experiance that was a highlight. We had a great stay. Apartment was lovely and roomy, clean and comfortable. We were met by the host who showed us round, gave us some tips on places to eat and left us a lovely bottle of local wine to toast our arrival! Perfect location, close to St Mark’s and Rialto Bridge but away from the bustle. Would highly recommend this to others and hopefully we will return one day. Plenty of room for our family of 4 and the location was great. you are in the centre of venice inside the most important shopping area of Venice .